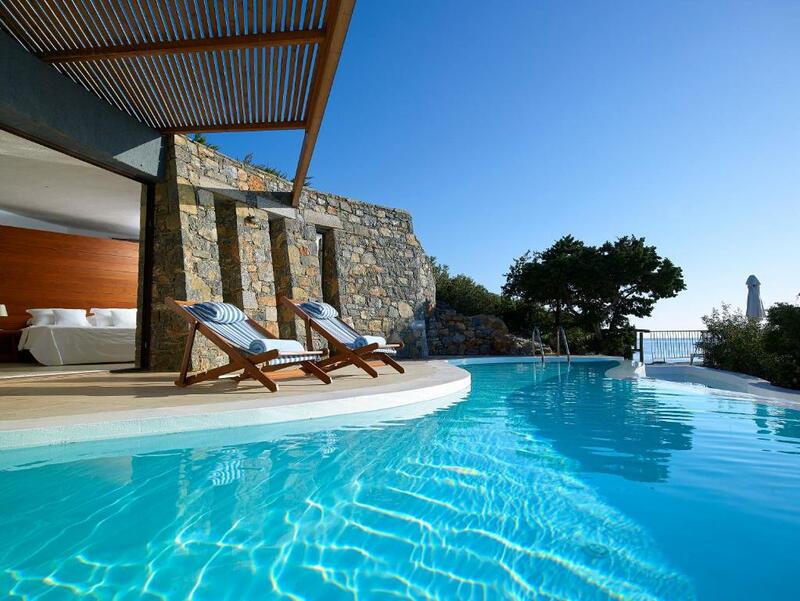 Located on a rocky cliff, Thalassa Villas overlooks the Mirabello bay and Aegean Sea in Agios Nikolaos of Crete. It features stylish self-catered accommodations with a private saltwater pool and a terrace with unlimited sea views. Offering free Wi-Fi, the modern Mediterranean-styled villas are fitted with a LCD satellite TV, DVD/CD player, spacious seating area and dining area, fully equipped kitchen and safety deposit box. The bathroom includes a spa bath and is stocked with slippers, bathrobe, hairdryer and toiletries. A rich breakfast including hot and cold dishes and Cretan specialties maybe served daily at the restaurant of a nearby hotel or in the rooms. 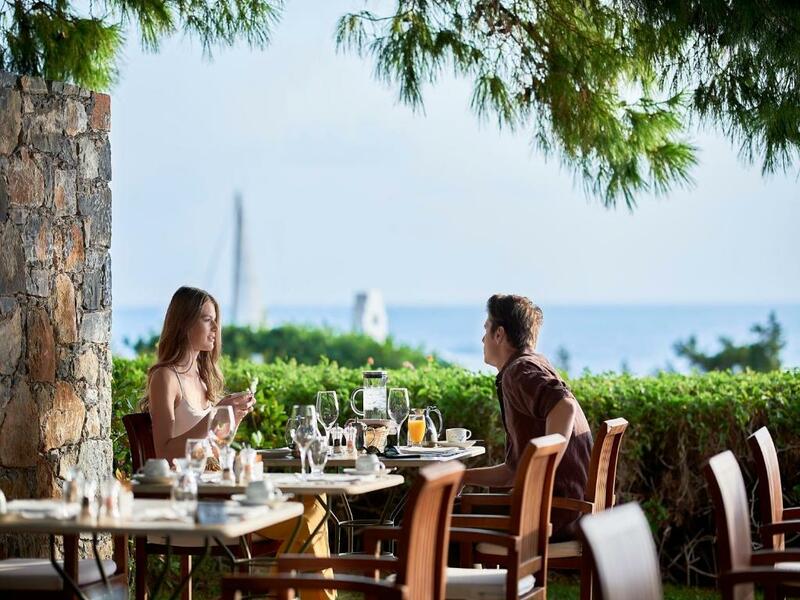 Guests can also enjoy their breakfast or indulge in a variety of cuisines that the connecting sister property has to offer. Guests can enjoy privacy while being able to benefit from the 5-star facilities and services such as, the spa and wellness center and the 5 restaurants of the neighboring sister hotel. A private beach is located just below the property and another just 250 feet away. 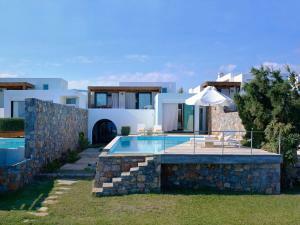 Thalassa Villas are 0.6 mi from the town of Agios Nikolaos and 5 mi from Elounda town. Heraklion Airport is 43 mi away. An airport shuttle service is available upon request at an extra charge. 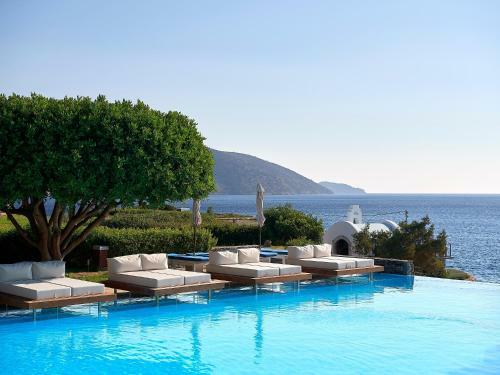 When would you like to stay at Thalassa Villas? Thank you for considering to stay at Thalassa Villas Luxury Villas at the waterfront located at Aghios Nikolaos small fishing town, the most trendy summer resort of Eastern Crete and an absolute safe destination. ACTIVITIES FOR FAMILIES, CHILDREN & TEENAGERS IN AGHIOS NIKOLAOS Aghios Nikolaos, located at 1,5 km distance from St. Nicolas Bay Resort Hotel & Thalassa Villas, and with over forty years of experience in the tourism industry, is and international and cosmopolitan resort that welcomes thousands of visitors annually. ACTIVITIES IN AGHIOS NIKOLAOS The town is built around its most charming feature, the Lake Voulismeni. Legend suggests that Athena and Artemis bathed in its waters, because it promised eternal youth. The lake is connected to the sea by a straight channel, while its natural surroundings of red rock and trees attract the visitor magnetically. At a small Open-Air Theatre by the lake, locals and visitors alike can enjoy interesting Artistic and Cultural Presentations, and children can play in the Playground while the parents enjoy a cup of coffee or a drink in a n A walk around the shops of Aghios Nikolaos is an enjoyable experience. In the many shops the visitor can find a wide selection of traditional Cretan artwork, copies of archaeological findings, jewelry and embroidery, woven items and Byzantine Icons. There are bustling bars, pubs and cafeterias, charming coffeehouses and more or less traditional tavernas serving traditional Cretan “Meze” or tidbits of local food. You can find innumerable opportunities for nighttime entertainment at a variety of Bars, Pubs and Discos. (Please note that children under the age of 17 years are not permitted entrance in the pubs/discos without being accompanied by an adult). Visit the outdoor summer cinema “Christina” featuring a new movie every week where the surrounding walls are covered by honeysuckle and you can enjoy a drink or coffee while watching the show. A high quality and range of athletic facilities provides professional athletes and sports fans, and local and visiting amateur athletes with the opportunity to get involved in any sports. There are Football Pitch, Tennis, Volleyball and Basketball Courts, Beach Volley Facilities, Mini-golf and Swimming Pools, all providing the opportunity for exercise and fun. ACTIVITIES AT A SMALL DISTANCE Additionally, Crete features a number of amusement parks that provide a fun day out for the whole family. Aqua Plus Waterpark Located in Hersonissos (approx. 30 kin drive), 5th km en route to Kastelli, next to the Golf Courts of Crete. The Waterpark occupies 57 acres of total fun for all the family with slides, pools, playgrounds etc. ; everywhere you turn you discover a new water attraction. Aquaworld Aquarium The aquarium at Gouves (approx. 30 min drive) is an ideal excursion for families travelling with slightly older children, showcasing local sea life and a menagerie of reptiles including a Burmese snake and a Nile crocodile. Beaches and Water Sports Crete’s coastal circumference is peppered with calm bays and sandy beaches that offer perfect opportunities for family fun. Many of the beaches are equipped with a wide range of water sports equipment such as banana boats, snorkelling gear, tubes and kayaks, which provide opportunities for endless summer entertainment. House Rules Thalassa Villas takes special requests – add in the next step! Thalassa Villas accepts these cards and reserves the right to temporarily hold an amount prior to arrival. Please note that guests have access to the facilities of the sister property St. Nicolas Bay Resort Hotel & Villas, providing a restaurant, 3 bars, a private sandy beach with watersports activities, as well as a spa and wellness center. We need at least 5 reviews before we can calculate a review score. If you book and review your stay, you can help Thalassa Villas meet this goal.